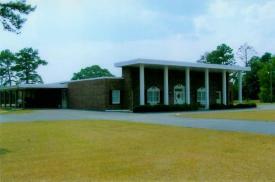 In 1969, Mr. Hart owner of Hart's Mortuary in Macon, Georgia felt the need to build a funeral home in Jeffersonville, Georgia. Mr. Hart believed that Macon was growing southeast, and Jeffersonville being only 25 miles southeast of Macon, would be the perfect location for a funeral home. In 1970, the Four County Funeral Home was opened in Jeffersonville. The Four County Funeral Home was named because of its location, near the joining of four area counties; Twiggs, Wilkinson, Laurens, and Bleckley. The building was constructed by a local (Twiggs County) contractor, Elder J.F. Little who was also a Primitive Baptist Minister. The Four County Funeral Home continued in operation until the late 1970's early 1980's, In 1984 the Four County Funeral Home was sold to Mr. Dean Allgood, a local businessman who changed the name to Allgood Memorial Chapel. Mr. Allgood and his wife Elaine ran the business, with the help of Funeral Director Claude Turner and the assistance of Mr. Bobby Mathis and his family from Mathis Funeral Home in Cochran. It was in 1984 that Harold Reece, Jr. joined the staff as a part time assistant. In 1987 after completing Mortuary College at Gupton-Jones College of Mortuary Science, Harold Reece, Jr. returned to Allgood Memorial Chapel, and became partners with Mr. Dean Allgood. In 1994, Harold Reece, Jr. purchased Mr. Allgood's portion of Allgood Memorial Chapel and became the sole owner, changing the name to Reece Funeral Home. Since 1994, Harold Reece, Jr., with the help of his father Harold Reece, Sr. and the rest of his family and with the help of several dedicated part time staff, have provided area families with service, professionalism, and dignity.